Replica soccer ball of the 2014 FIFA World Cup in Brasil with the same panel design as the Brazuca Match Ball. Outer: Made from 100% TPU outer. 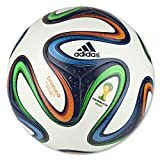 Part of adidas" World Cup series and based on the Brazuca Match Ball, this adidas soccer ball delivers impressive control and flight, so you can test out plays from your favorite team with precision. The adidas World Cup 2014 Brazuca Top Glider Soccer Ball"s machine-stitched construction ensures soft touch and high durability. Made with tough TPU and a butyl bladder for improved air retention.